Earlier this year, at the CFC gathering in the Dominican Republic, a peculiar Añejo vitola was nonchalantly distributed to attendees (myself included). Essentially no information was given, except vague rumblings from a staff member that it was using the project name “88” or “888” (not necessarily the final name), and was scheduled to ship between then (Feb 2014) and December. In the past week, articles have popped up throughout online cigar media of its imminent delivery in September. So, I thought I’d share my thoughts about the cigar today. The wrapper, from all appearances, is CT Broadleaf like all the other Añejo. I received no details about the internal components, and won’t speculate until I have something more firm….which is rare, as the Fuentes’ like to keep blend components close to the vest. It is incredibly dark in color, and slightly rustic with pronounced veining as would be expected. Dimensions are roughly 6 5/8″ x 44 – including the long, tapered head. MSRP has not been released as of yet – for review purposes, I estimated pricing based on typical Añejo pricing in the Tampa market. Before lighting, the draw resistance is near perfect with only a slight clip of the pencil point head. I chose to leave about a 1/4″ opening, knowing that I could cut more off needed. Cold flavor is savory and dark. As for aroma, very little is perceptible from the wrapper, but a bold sweetness with slight cedar note is present at the foot. The initial puffs from this stick were surprisingly spicy; not something I expect from an Añejo. The flavor is very savory – literally causing a salivary response. In the first third of the cigar, the balance is exceptional, walking a delicate tightwire between strength and flavor. I’d put the strength at a heavy medium/light full, and flavor intensity about the same. 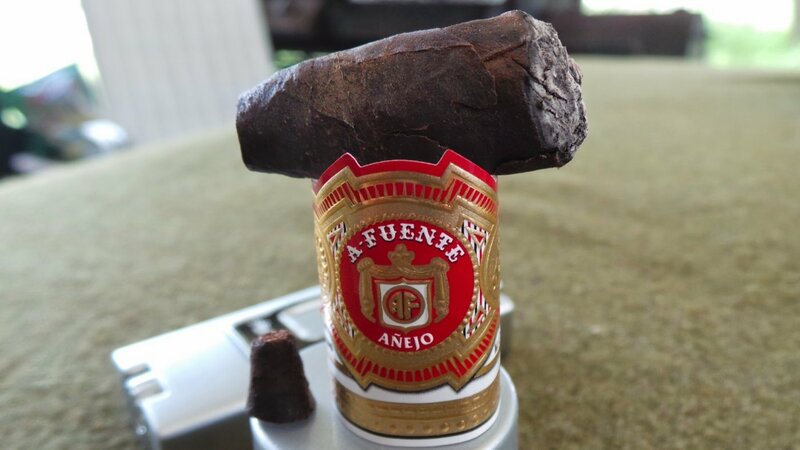 The flavors are not the rich cocoa and chocolate I am accustomed to with Añejo, but a bit more “bright.” The cigar is warmer to the touch than normal, with the heat being felt nearly 3/4″ behind the burnline – although the burnline is quite straight, never wandering much. Into the midsection, the 88x? becomes a little more recognizable as an Añejo. It develops more of the dark sweet, cocoa that is often prevalent in the line. I’m thankful I kept the opening at about 1/4″, as I believe cutting it much further down the head could have led to some overheating and flavor loss. Burn is still very good, with only mild scalloping around its perimeter. The final stretch shows lots of promise, with an amplification of both flavor and strength (but not too much strength for an admitted nicotine wimp like myself). The burn did wander more during this time than earlier, but continued to self-correct. The flavors maintained the sweetness, but were tempered with solid cedar presence. The interplay was very entertaining. The few problems that you did have with this cigar are due to it being fresh. All Anejo’s smoke best at 2-3 years of age, that also explains the spice over the normal Anejo smooth chocolaty 1/3 flavors. Anyways great review and I know for sure you are the first to review this cigar. Thanks. 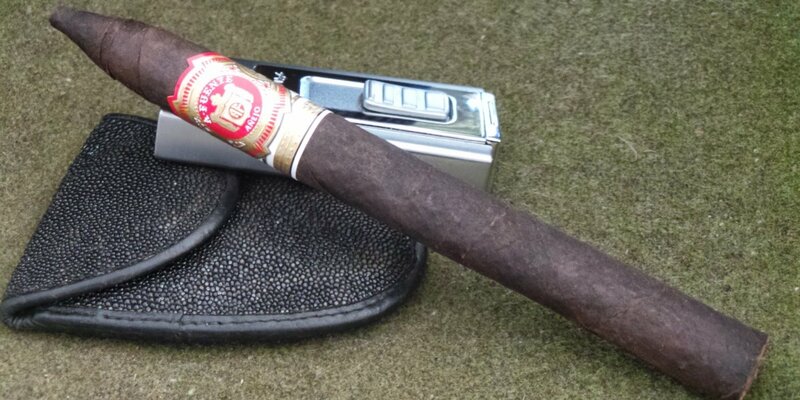 The vitola is actually called the 8-8-8…Halfwheel reviewed it today (got an 86). Yep. The name was publicized after I’d written this review. They’re already on the shelf, BTW. I guess they called it pre-release because their examples came from CFC as well. I’m surprised they came up with an “86.” For my tastes, this is pretty close to the top of my favorite Añejo vitolas. I don’t know how they come up with the numbers they assign, though. From their notes, it appears the construction was very near perfect, and their only real beef was with the subjective flavor factor. No accounting for tastes, I suppose. The only reason they gave it the score they did (86) is because the Anejo line needs age, just like a Cuban. They can be very harsh, strong and brash in their youth. I am not a huge fan of Dominican tobacco but I do love Anejo/Opus with years of rest.